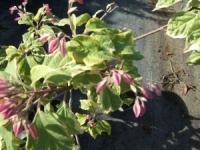 This semi-evergreen suckering shrub has attractive dark stems with large heart shaped leaves. In late autumn it becomes quite an eye-catcher when it produces large dome shaped terminal clusters of small fragrant pink-red flws. 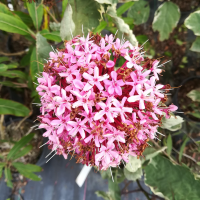 Ideally suited to smaller gardens or pot culture, Clerodendron Pink Diamond is a relatively new variety and a really attractive alternative to its parent, with attractive creamy white edged dark green leaves topped by a superb display of clusters of fluffy lipstick pink flowers in late summer and early autumn. A most unusual vigorous deciduous shrub of upright habit. Late summer sees the formation of deep pink and green flower buds, which open to fragrant white star shaped flowers over the large spear shaped leaves. 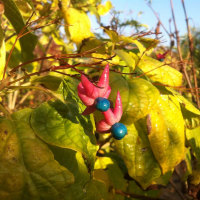 Blue berries follow.